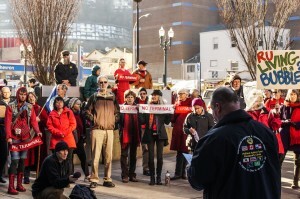 Portland, OR – Tuesday: Hundreds gathered in a rally and packed the Planning and Sustainability Commission public hearing to show their opposition to the controversial propane terminal proposed by Pembina Pipeline Corporation. 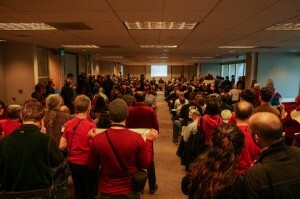 With standing room only, the Planning and Sustainability Commission had trouble accommodating the large crowd, and over 100 people signed up to testify. The meeting ended with over 2 hours left of testimony un-heard. Community members spoke to climate impacts of propane, the destruction caused by fracking, and the impact to the sensitive conservation area at the proposed terminal site. Community opposition and numerous unanswered questions regarding the planned terminal caused the Planning and Sustainability Commission (PSC) to postpone their decision and schedule a second public meeting to consider Pembina’s proposal on March 17, 2015. Pembina Pipeline Corporation, with investments in the Canadian tar sands, wants to bring explosive liquid propane by rail to Portland for export to Asia from the Port of Portland’s Rivergate Terminal opposite West Hayden Island. 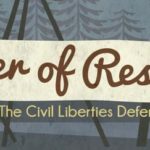 This proposal will require that a pipeline be built crossing a fragile riparian area along the Columbia River which is zoned as a conservation area. Portland currently has a zoning code that prohibits the transport of hazardous materials via pipeline, like liquid propane gas (LPG), through such zones. In order for the proposal to move forward, the PSC would have to modify this zoning code. Today was the first public hearing held regarding the zoning amendment. “The analysis of the Pembina proposal provided to the PSC fails to address many potential risks to human health, safety, and equity, now and into the future. We ask the Commission to recommend against any code changes that would allow this dangerous project to move forward,” said Regna Merritt of Oregon Physicians for Social Responsibility. According to standard US government figures, the daily climate impact of this propane once burned would be equivalent to the daily emissions from 760,000 passenger vehicles or almost 1.5 times the number of such vehicles registered in Multnomah County in 2013. The propane is likely to be sourced from “fracked” gas and Alberta’s tar sands, the target of international protests due to the impact tar sands extraction is having on First Nations peoples and the environment. Fracking has been banned in several states due to its serious health and environmental impacts. The Pembina project is one of many projects proposed around the country that have met resistance from grassroots groups, including the Keystone XL Pipeline, coal, oil and gas terminals, and oil by rail projects. 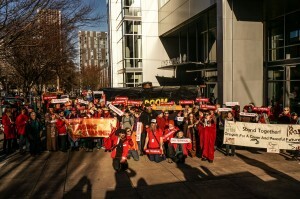 “Using environmentally sensitive port lands to facilitate a $6 billion-a-year foreign company’s exports of a greenhouse gas pollutant originating from carbon intensive and environmentally destructive sources could not be further from Portland’s recently achieved title of ‘Climate Champion’ ” said Dr. John Talberth, President and Senior Economist with the Center for Sustainable Economy. The Climate Action Coalition (CAC) is calling for the rejection of the proposed propane terminal in Portland and for a moratorium on all fossil fuel infrastructure and transportation construction in Oregon. Sponsored by Climate Action Coalition of Portland: Portland Rising Tide, Raging Grannies, 350PDX, Unitarian Universalist Community for Earth, NoKXL, PDX Bike Swarm, Sustainable Energy & Economy Network (SEEN).